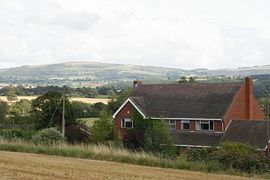 Ros and Anson welcome you to their home in Munslow, enjoying views across the glorious Corvedale countryside to Brown Clee the highest point in Shropshire. We are conveniently placed for access to the many attractions of Shropshire including the attractive market towns of Ludlow, Much Wenlock, Bridgnorth and Church Stretton. There are also historic houses and the cradle of the industrial revolution at Ironbridge. All around are the beautiful South Shropshire hills which are ideal for walking and cycling. 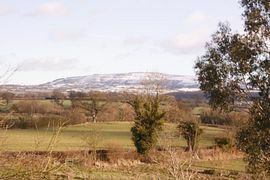 The Clee Hills and Wenlock Edge are at our front and rear. It is a wonderful place to live and we look forward to helping you enjoy a stay in our B&B. We aim to make your holiday in the South Shropshire hills memorable and we provide full facilities for walkers and cyclists. A drying room is available for wet clothes, boots and equipment and a secure covered area is provided for bicycles. Guest bedrooms are en-suite and fully equipped. En-suite shower, basin and WC with toiletries. Wardrobe, chest of drawers, chair, mirrors. Flat screen wall mounted TV. Tea/coffee making facilities, mini fridge with fresh milk and spring water. Guests can relax in their bedrooms or in the hall lounge which has comfortable chairs, a music centre and information on Shropshire attractions. 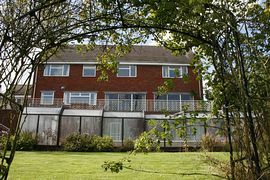 On sunny days guests can relax on the terrace or in the garden enjoying the views of the Clee hills. 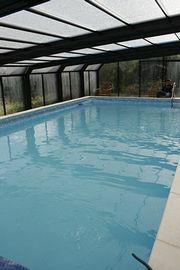 The covered swimming pool is available throughout the year. Breakfast is served in the dining room, or the adjacent terrace that gives panoramic views across the Corvedale when the sun shines. Our delicious breakfast is locally sourced. Made to feel at home. Wonderful place and view. Coseley House is located on the B4368 that runs between Craven Arms on the A49 (between Ludlow and Shrewsbury) and Morville on the A458 (between Bridgnorth and Shrewsbury). 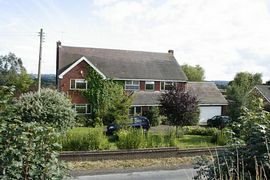 Coming from Craven Arms, the property is found on the right hand side some 300 meters from the Crown Inn. From Morville, Coseley House is on the left hand side approximately 200m after the 30 mph speed limit at the entry to Munslow village.